At a Capitol news conference Tuesday with Auditor General Eugene DePasquale (left) and Rep. Kristin Phillips-Hill (R-York), Rep. Dan Moul (R-Adams) stressed the need for audits of the Susquehanna and Delaware River Basin commissions, which he said lack apparent oversight, transparency and accountability. The auditor general said he will begin simultaneous audits of the commissions immediately. His findings are expected to be presented to the General Assembly this summer. HARRISBURG – At a Capitol news conference this morning with Auditor General Eugene DePasquale, Rep. Dan Moul (R-Adams) expressed his appreciation and support for the auditor general who will soon embark on the Commonwealth’s first-ever audit of the Susquehanna and Delaware River Basin commissions. The Susquehanna River Basin Commission (SRBC), an interstate compact involving Pennsylvania, New York and Maryland, which manages and regulates water resources in the Susquehanna River basin, first came to Moul’s attention about three years ago when water authorities and others in Adams County began complaining about onerous regulations and exorbitant fees charged by the SRBC, costs that were falling squarely on the shoulders of their customers – the ratepayers. “Meetings with the SRBC did not allay my concerns, and in fact, they heightened them,” said Moul. “It was apparent that the SRBC lacked the oversight, transparency and accountability that is common in our government agencies. In fact, I learned that the SRBC is not required to adhere to Pennsylvania’s Right-to-Know Law, nor is it accountable to the Independent Fiscal Office or the Independent Regulatory Review Commission. “As a state representative, I answer to my constituents – the taxpayers of Adams County. No government entity should go unchecked. 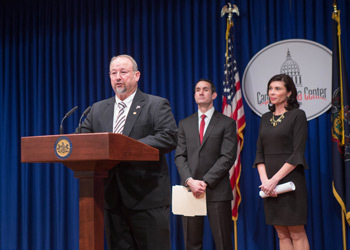 Even though these compacts are not state agencies, Moul pointed out that they operate with taxpayer dollars and should be held accountable to the General Assembly. Yet, they are not. To hear Moul’s remarks following today’s news conference, visit RepMoul.com.